If you liked this show, you should follow *BlackJesusRadio*. 8/14/17 Mon. 8:00 pm EST - Call # (619) 924-9807 & Press (1) to Speak ! 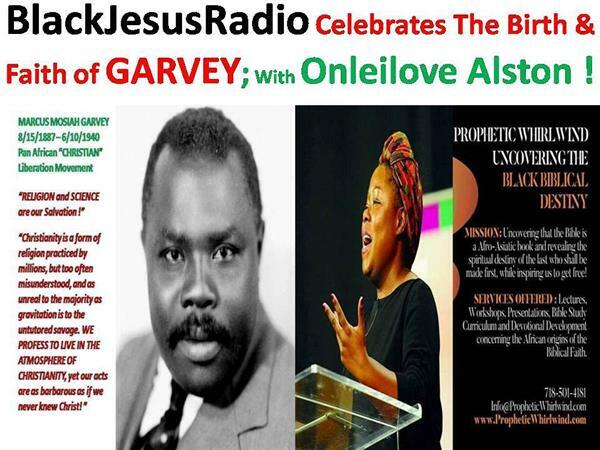 BlackJesusRadio Celebrates The Birth & Faith of Marcus Garvey with Onleilove Alston ! Book: "PROPHETIC WHIRLWIND UNCOVERING THE BLACK BIBLICAL DESTINY"
M - 8pm EST "The BlackJesusMinister Show"
T - 7pm EST "The Show"
W - 8pm EST "The Ahwar Da Swordsman Show"
T - 8pm EST "The Brother Mercy Show"
F - 8pm EST "The Mz. "O" Show"
S - 8pm EST "The Lorraine Show"
S - 10:30 EST "The Bishop Adjei Int'l Min. Show"
John 8:32 kjv - "And ye shall know the truth, and the truth shall make you free." Seeking persons proficient and knowledgeable in (a) Promotions Advertisement, (b) Social Media forums esp FB & YouTube, (c) Production in Social Media Audio & Visual, (d) Debaters, (e) Show Hosts, (f) Bible Teachers, (g) Christian Counselors, (h) Educators, (i) Musicians, (j) Poets, and much more !! !